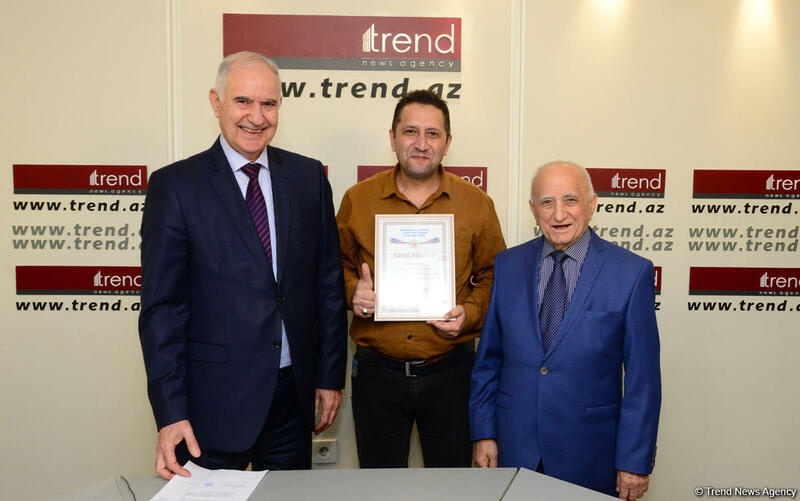 An award ceremony of several employees of Trend news agency in connection with the 100th anniversary of the Azerbaijani security agencies was held at the press-centre of the agency, Trend reports. 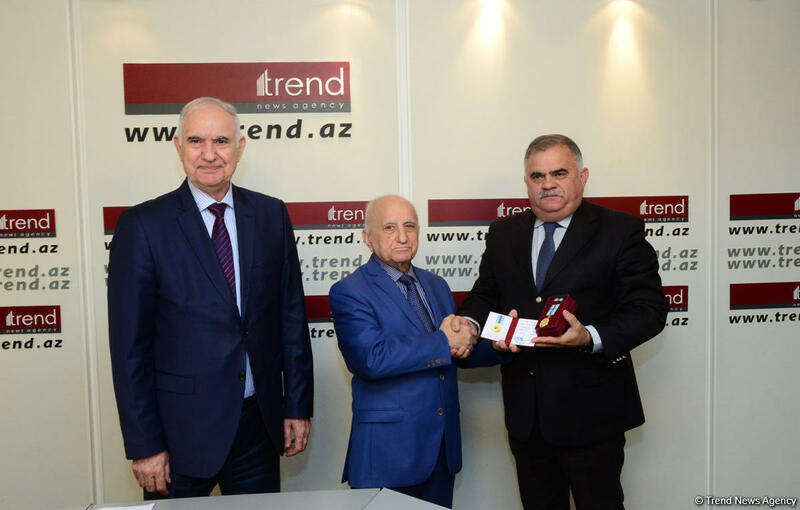 Shamil Suleymanov, Chairman of ‘Alliance’ Public Union of Veterans of Security Bodies presented ‘Mehdi Huseynzade’ medals to Deputy Director General of the Trend news agency Arzu Naghiyev and Head of Expert Council of the Baku Network Elkhan Alasgarov, while staff members of Trend news agency Vugar Imanov and Samir Gulaliyev were awarded honorary diplomas. 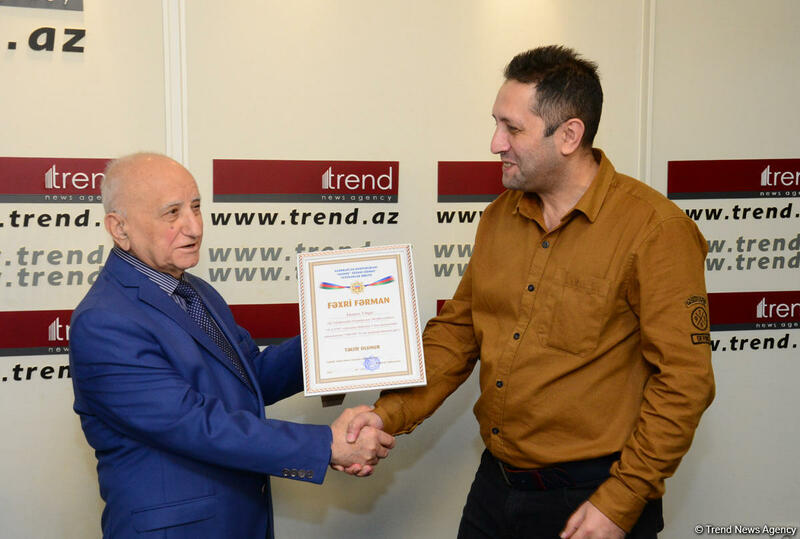 Speaking at the ceremony, Shamil Suleymanov emphasized that Trend news agency laid a solid foundation for advocacy of the Public Union activities. 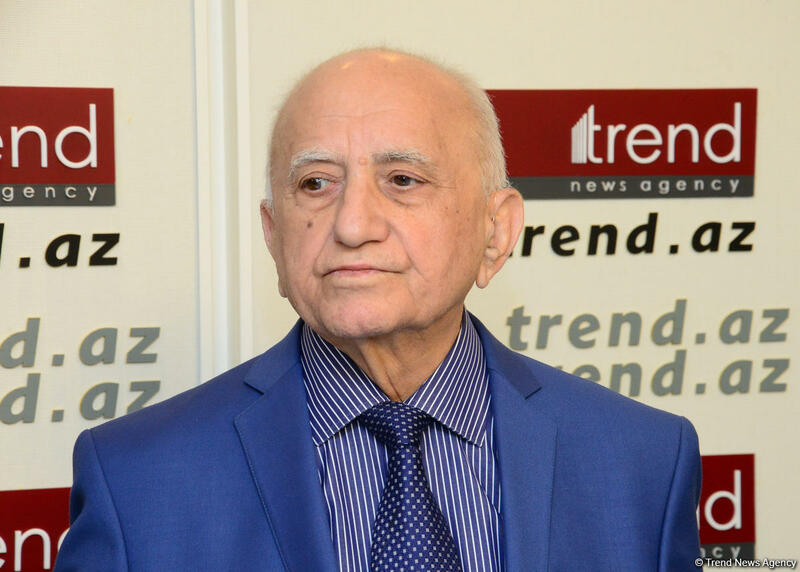 Sharing his memories about national leader of Azerbaijan Heydar Aliyev, Shamil Suleymanov said that he was one of those who began to work in the national Azerbaijani security agencies under direct supervision of Heydar Aliyev. "Heydar Aliyev did his best to nationalize the Azerbaijani security bodies and educate Azerbaijani personnel,” said Suleymanov. “After 1960, the work of the Azerbaijani security bodies changed significantly as a result of efforts taken by great leader Heydar Aliyev. 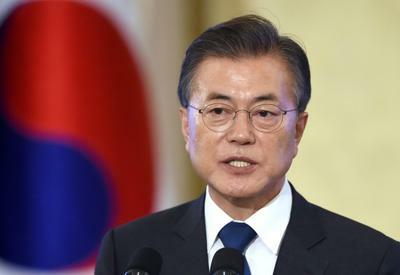 After the national leader was appointed the Head of the Security Bodies, the number of national personnel in this system rapidly increased," he added. 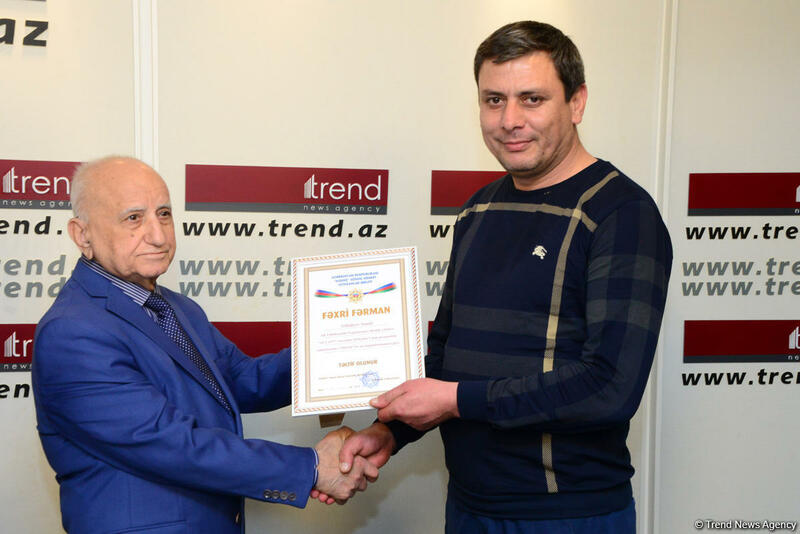 “The great leader took efforts for training the personnel working not only in the security services, but also in other law enforcement bodies,” said Shamil Suleymanov. 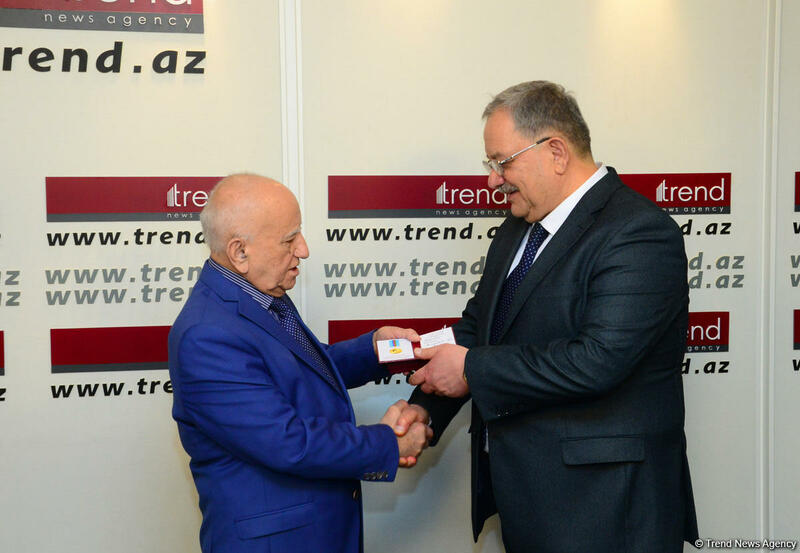 "He was interested in all spheres and did everything possible for the development of the Azerbaijani people," he added. 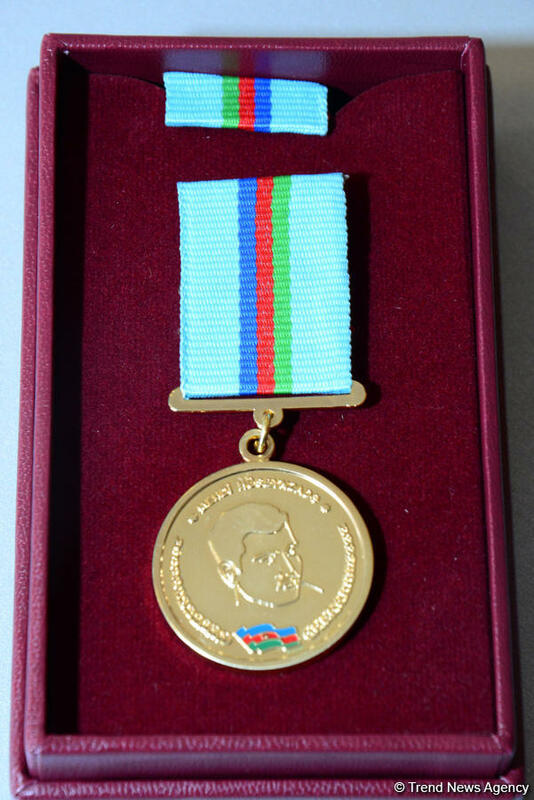 In his words, President of the Republic of Azerbaijan Ilham Aliyev also extends special attention and care for the employees of national security services. 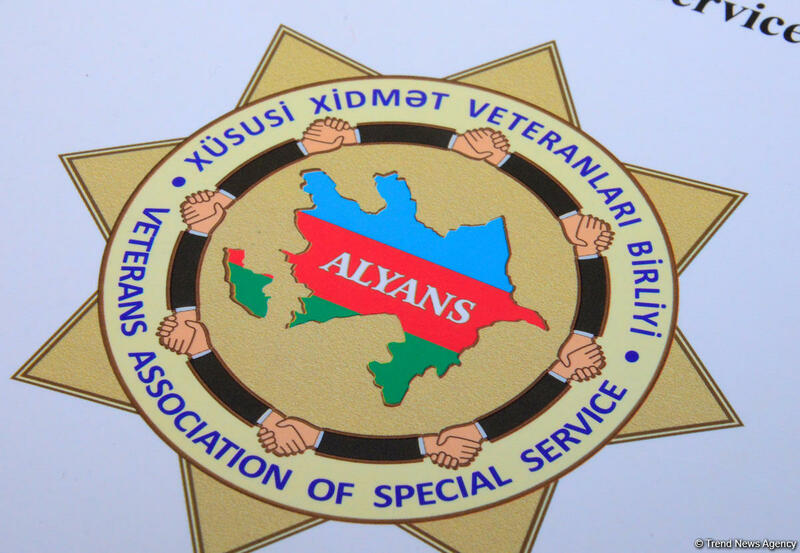 "Veterans of the security bodies support social-economic reforms carried out by President Aliyev," said Suleymanov. 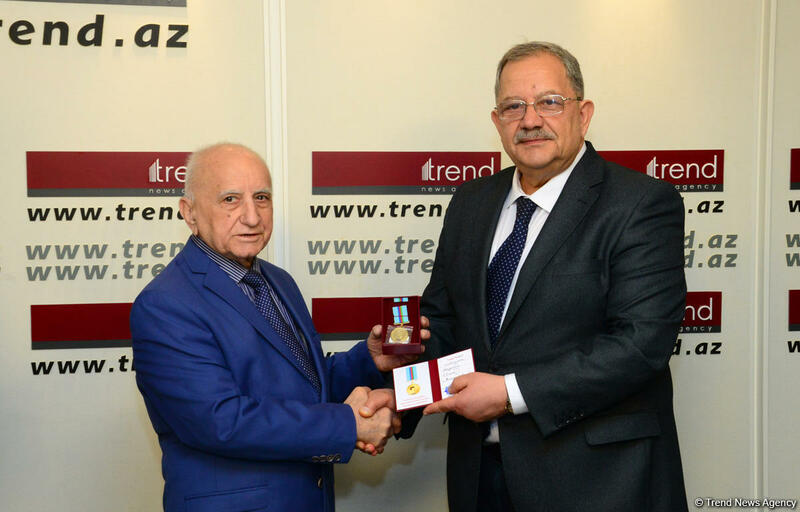 As Suleymanov informed, 100th anniversary of the Azerbaijani security agencies was solemnly celebrated. 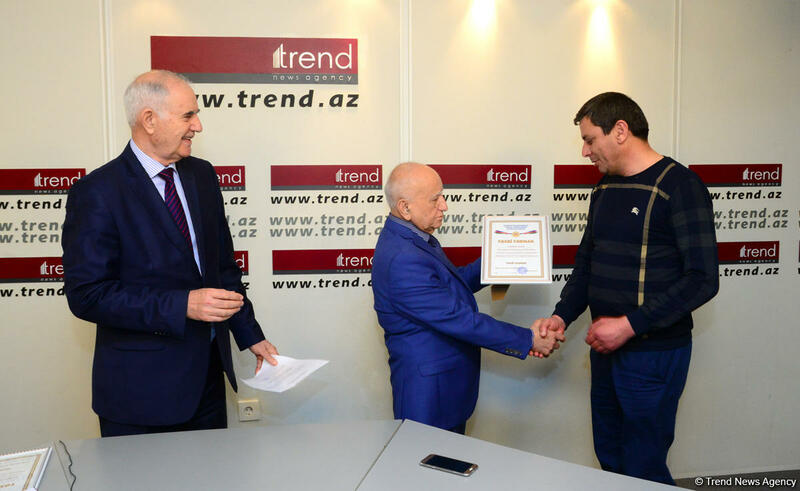 "The leaders of veteran organizations from Russia, Belarus, Kazakhstan and Kyrgyzstan arrived in Azerbaijan to take part in the final celebration by the ‘Alliance’ Public Union, which was held at Buta Palace under direct supervision of Head of the State Security Service Madat Guliyev." 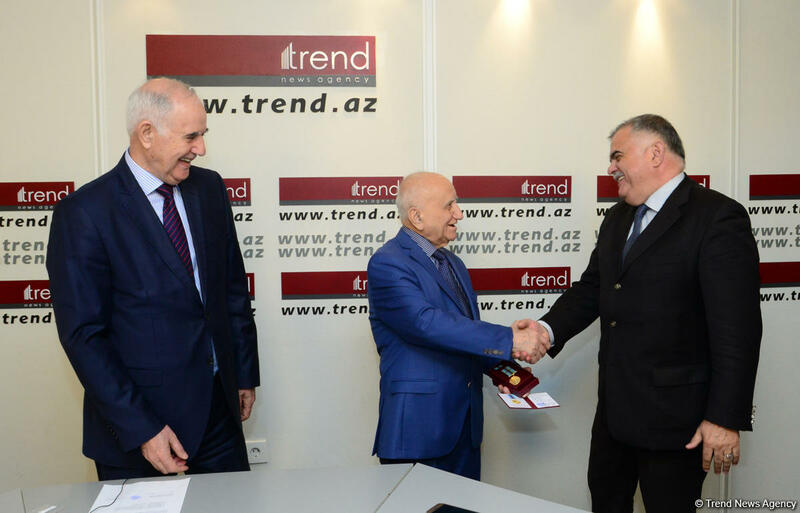 Then Suleymanov spoke about the books he has written, which also highlight several operations carried out with the direct participation of Heydar Aliyev. “Some of the books disclose certain aspects of the operational activity of the security agencies. 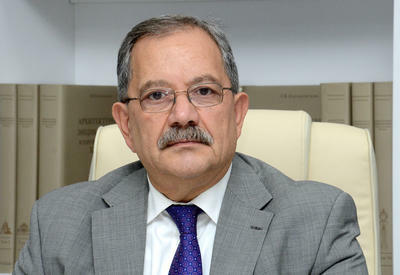 When my book entitled "Devotees are needed" was prepared for printing in Moscow in 2005, I was told that such a book must not be published, because it reveals our operational work," said Suleymanov. “The publishing house refused to publish the book until the permission was obtained and printed it only after the permission was granted,” he added. Then he presented his books to the event participants. 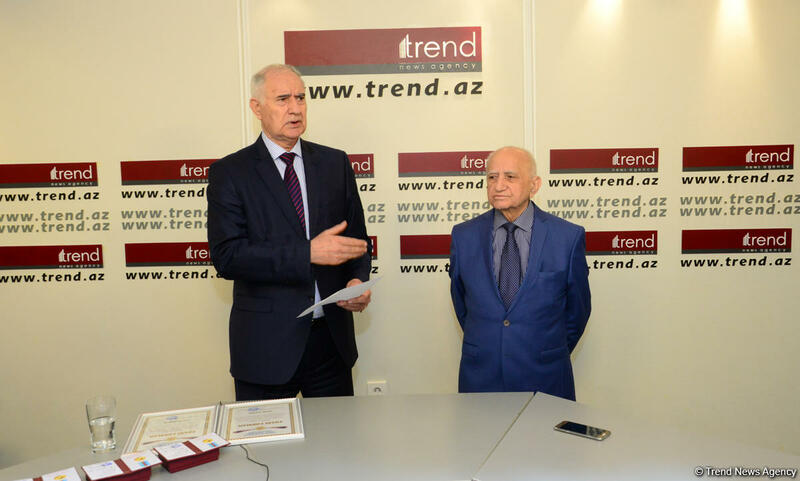 “After Heydar Aliyev came to power, a big breakthrough occurred in this system. 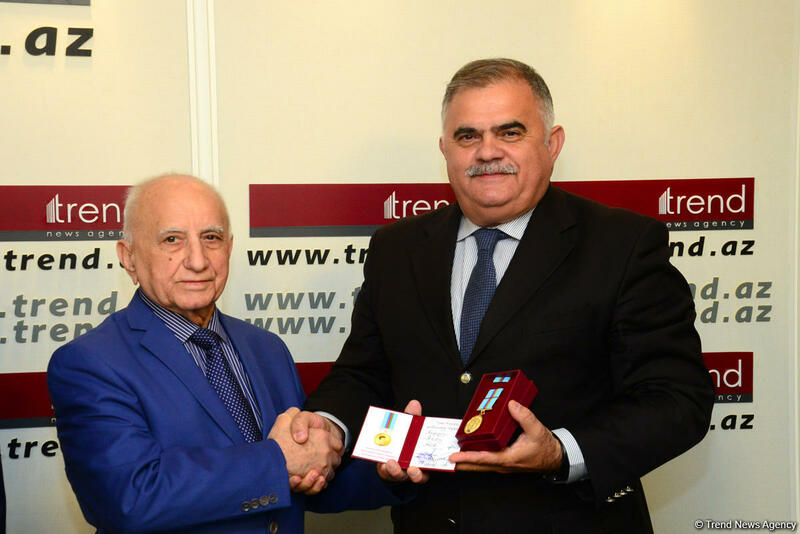 The great leader took efforts to increase the number of national personnel in the Azerbaijani security agencies, as it was one of the major issues of the existing system. 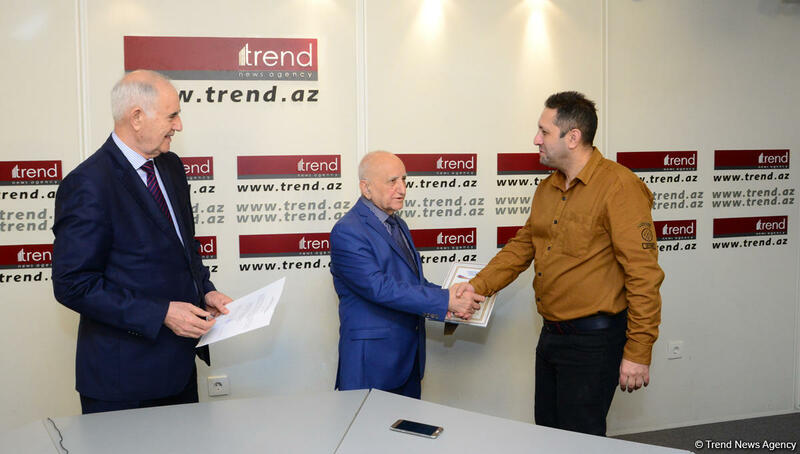 This process was consistently carried out after 1953," Azer Garayev said.